My neighbor and BBQ teammate, John, makes the best pizzas. If it is Saturday evening, you can book that he is out by his Grill Dome firing up this week's version. They do them differently each time but the one constant is that they are crispy and delicious. One reason that their pizzas are always so good is that they get a LOT of practice. But a key to their fantastic pies is cooking them on a kamado ceramic grill. 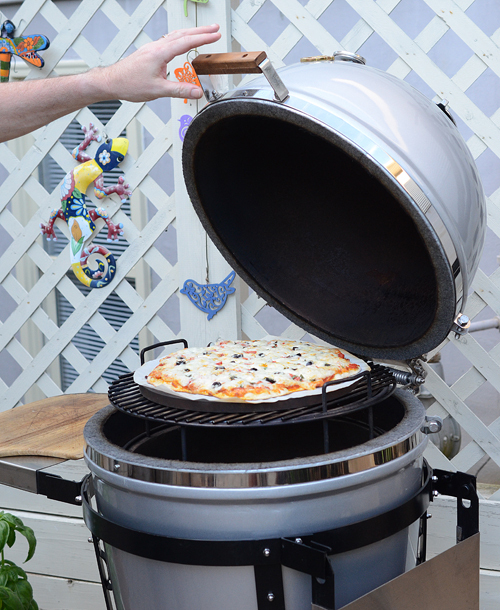 The ceramic dome and wood coals mimic a wood fired pizza oven like all of the trendy pizza places use these days. 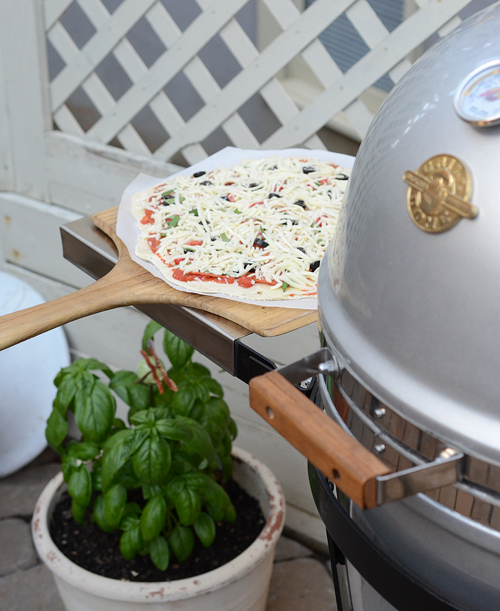 You can cook a pizza on just about any grill but a ceramic grill gives it that perfect crisp crust and subtle smokiness. 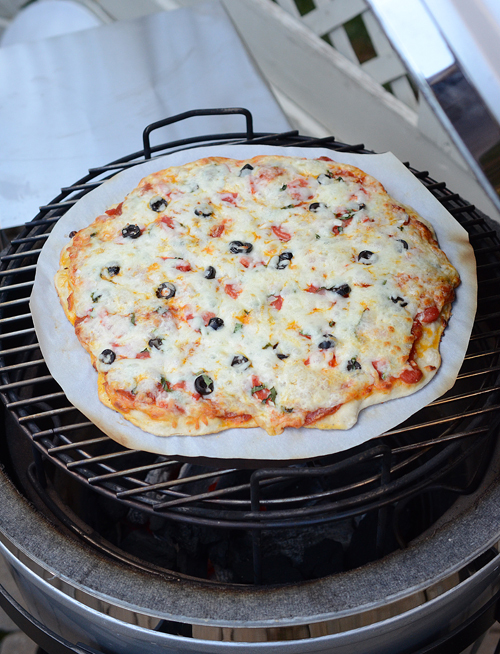 Like I said, John's "house pizza" varies from week to week but here are his general guidelines for cooking pizza on your backyard pizza oven, also known as a kamado grill. 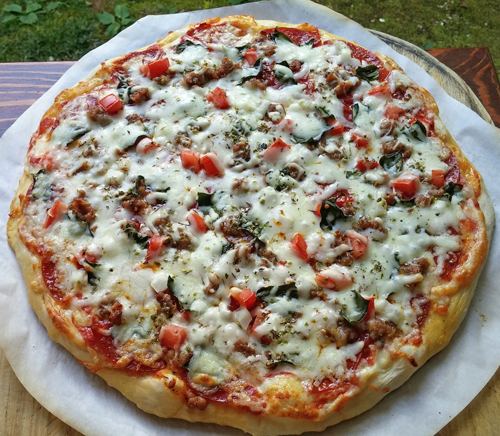 If you are doing a pizza during the week, you can make this a 20 minute recipe by either making the dough ahead of time or cheat like I do and buy the dough at your local pizzeria. Most only charge a few bucks for a ball of dough. Mix the dry ingredients together. Mix the wet ingredients together. Combine the two in a large bowl until in forms together in a ball. 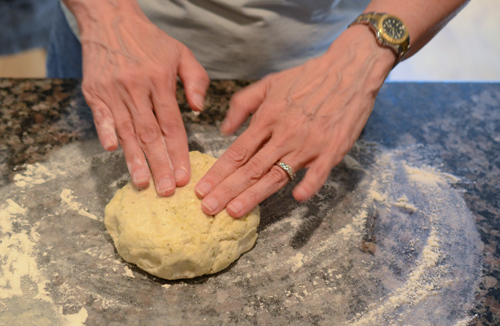 Move to a floured surface and knead for 5 minutes, adding more water if it gets dry and begins to break. Cover with a towel and let rize until it doubles in size, anywhere from 30 minutes to 2 hours depending on humidity, etc. Then roll out as thin as possible into a 12 inch circle. He suggests putting the dough on parchment paper to cook and move to the pizza peel easily - idiot proof. He underestimates my idiocy. Combine ingredients and bring to a slow boil. Lower heat to a simmer and simmer for 30 minutes. Whatever floats your boat. 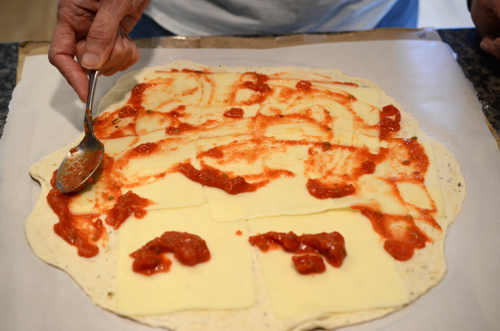 For basic pizzas, John likes to start with a layer of thin sliced mozzarella or provolone on the top of the raw crust and then spoon a light amount of the sauce over this. 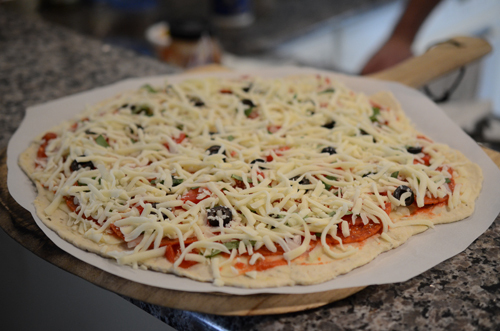 Then top with shredded fresh mozzarella and your favorite toppings. See Variations for ideas. Either indirect with a pizza stone on the cooking grid or raised direct with the main grid raised above the felt line and a pizza stone on it. It is very important to let the stone and ceramics of the kamado grill preheat to 500°F for 45 minutes to get the full "pizza oven" effect. The air temp will be 500°F quickly but it takes time for the ceramics to warm all the way up. 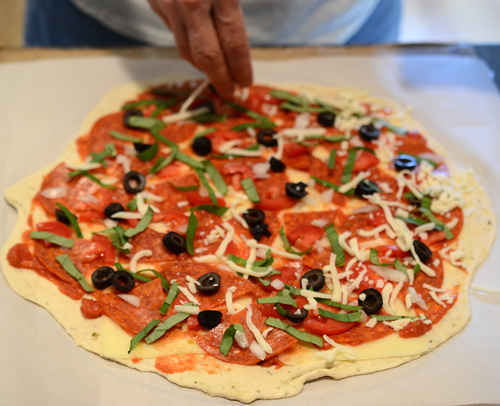 Place pizza on the stone and cook until the toppings brown slightly and the crust is nicely browned, 5-15 minutes depending on the toppings, crust, and cook temperature. 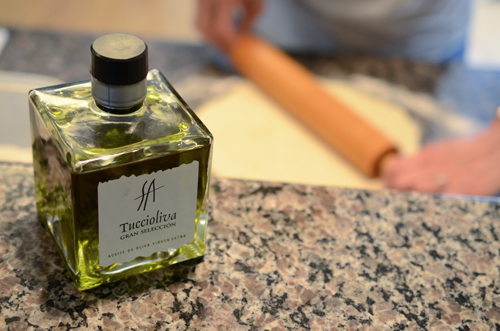 This will be about 5 minutes for Margherita style, 8-10 minutes for thin crust, and 10-15 minutes for thick crust. Buffalo chicken - substitute pizza sauce with buffalo wing sauce, top with about 1/2 cup of cooked shredded chicken, your favorite cheeses (make sure to put some blue cheese in there) and some banana peppers. 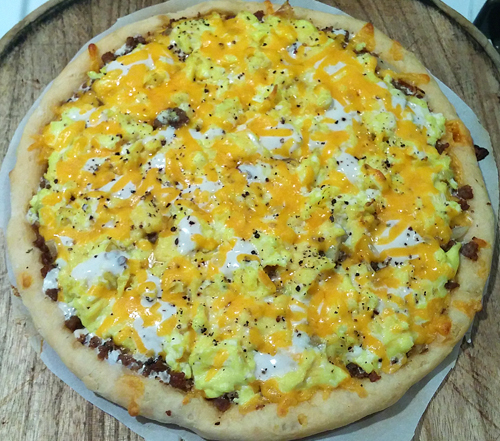 BBQ pizza - Use BBQ sauce as your base, leftover chicken, pork or beef BBQ, cheese, and other toppings. Margherita - Tomato, fresh basil, fresh mozarella, and a simple tomato sauce. You can do at the same temperature (500°F) or go higher for true Neopolitan style at temps north of 750°F and very short cook times. Can't decide? Do a half and half! 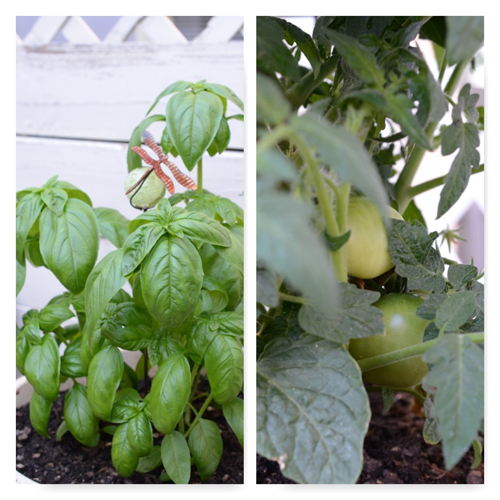 Using the freshest ingredients make the best pizza so John and Anna Mae grow their own basil and tomatoes. 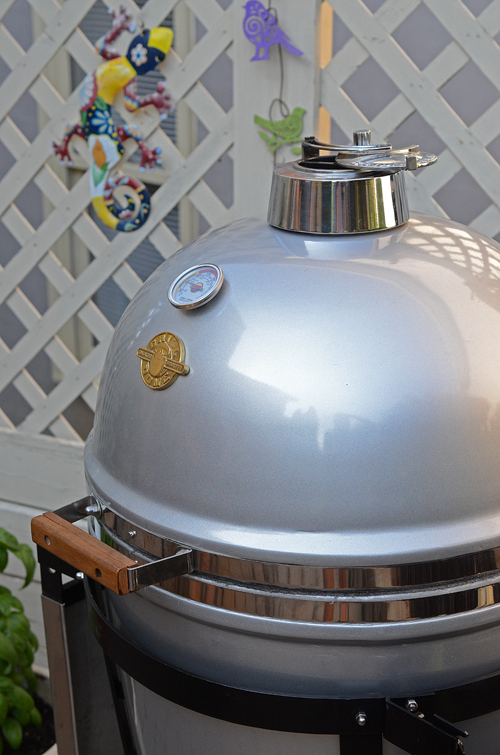 Have your kamado grill pre-heating while putting your pie together. 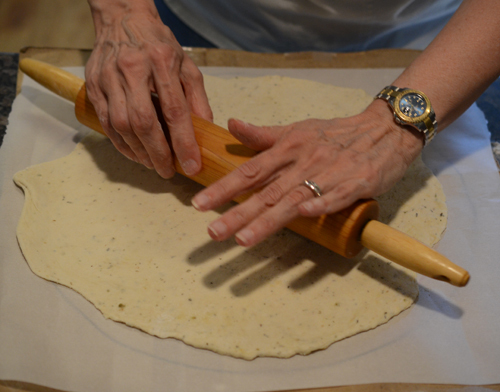 Rollin' rollin' rollin', get those pizzas rollin'! 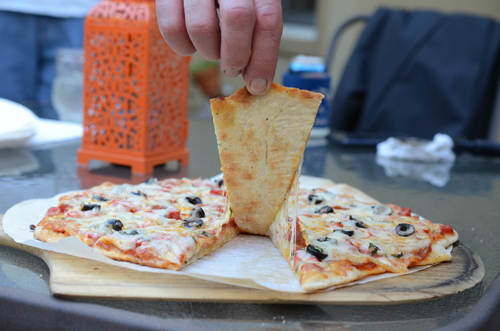 John swears by using only high quality for his pizzas, says it makes a huge difference in the crust. 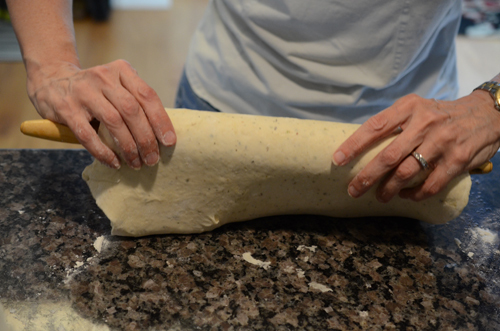 When moving the dough, Anna Mae rolls it up on the rolling pin to keep it from stretching out. Notice the specks in the dough? That's because another variation they like to do is to sometimes add some Italian seasoning, rosemary, oregano. or other herbs to the mix. About 1-2 teaspoons total. John says that sauce is one of those "less is more" things. Dress it up the way you like it. 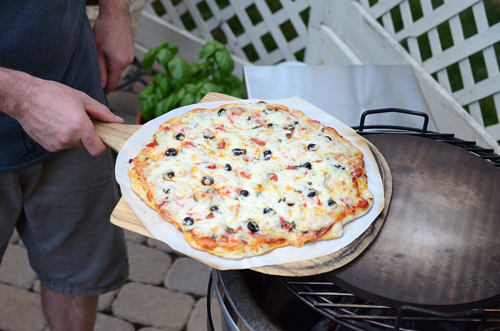 The parchment paper and pizza peel make transferring the pizza to the grill or oven easy. Pizza ready to go on the grill while the poor basil plant has to watch. Raising the pizza up above the felt line and closer to the dome lets you take advantage of the reflective heat from the dome. Notice that while the parchment paper browns, it doesn't ignite during the cook as long as you trim the edges so they don't stick out too far past the pizza stone. 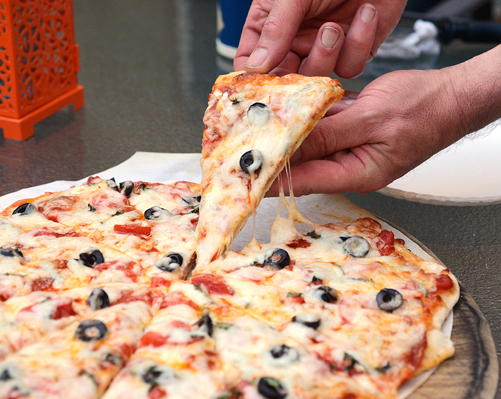 Pizza al fresco - the best way to eat pizza! 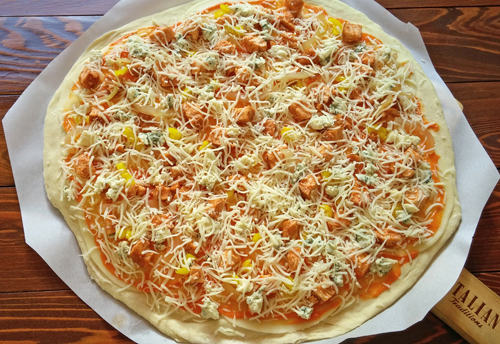 Buffalo chicken pizza being put together. 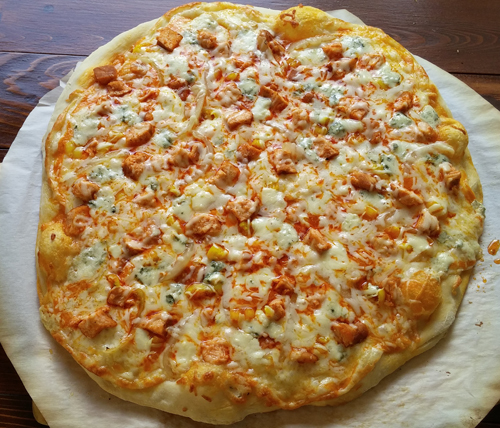 Buffalo chicken pizza - one of my person favorites that John makes. 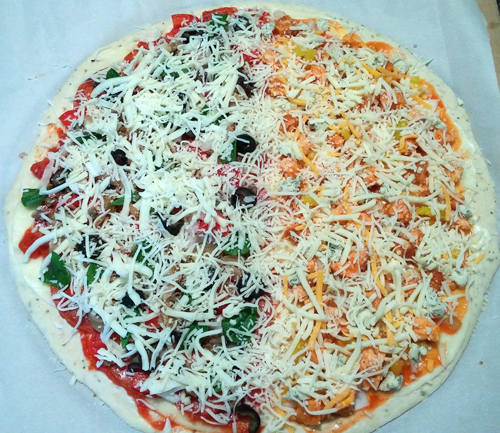 Two faced pizza being put together. 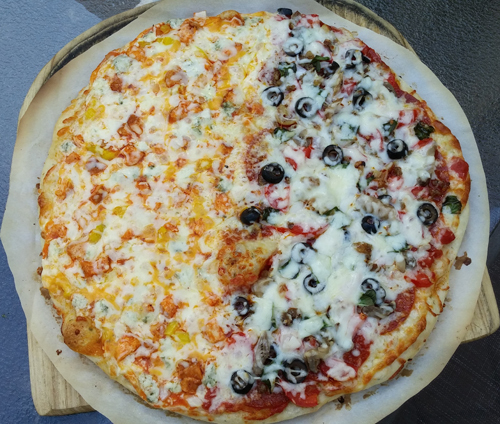 Two faced pizza - half Buffalo chickens and half Italian. So many pizzas - so little time! [FTC Disclaimer] Grill Dome is a sponsor of our competition team and blog.